I have had my grandson’s smiling face beaming at me from my home page for a little over 3 weeks now which has been bitter sweet. Some days I have cried and others I have smiled back into his eyes, remembering him as the lively, happy and cheeky little boy he was. Moving on is really hard. Nothing is ever going to be the same. Nothing will remove the pain of our loss but we have to keep moving towards ‘normality’ again. I have found it particularly hard to start doing anything creative again…it is very hard to concentrate, but I have had to knuckle down and get to work this week as I have had a long standing commission to make a 30th birthday cake for an Everton football team fan. 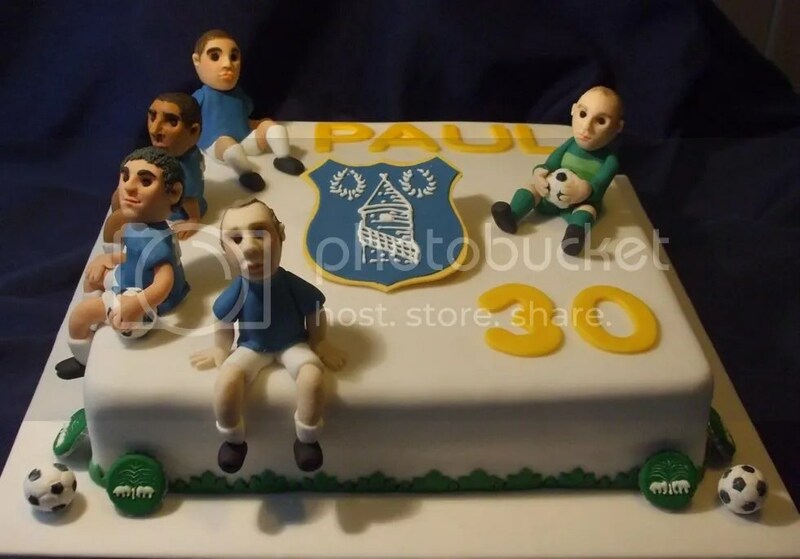 Having seen the cake I made in 2009 (see Just a bit of showing off..Cakes archive) I was commissioned to make another large cake with the Everton players Heitinga, Rodwell, Arteta, Beckford & Howard represented as sugarpaste models. As with everything, the more you do something the more refined your technique becomes and so there is quite a difference between the style of the characters on the two cakes, made nearly 2 years apart. The cake was very well received, which is always a relief, but particularly so this time as I had found it so hard to concentrate on the task in hand but I am one that believes that everything that is done should be done to the best of my abilities and so was determined to give it 100% despite everything. Hopefully, making a success of this cake will give me a bit of a shove in the right direction towards the goal of picking up the threads of my life again.